The first crowd-sourced research of its kind designed by RA patients, for patients, to better learn what their care experiences are like in their country, the global survey fielded responses from 2,690 respondents from 14 countries in Europe, the Middle East, and North and South America. The survey highlights self-reported gaps and delays in all five key elements of a standardized RA models of care, including significant delays to diagnosis and specialist access in the countries surveyed, patients not meeting their arthritis specialist often enough, and the need for education/information to increase patients' confidence to describe RA and improve their ability to care for themselves. The Global RA Network presented the results of a global survey - “Patient Experiences of Rheumatoid Arthritis Models of Care: An International Survey” - investigating patient-reported experiences of rheumatoid arthritis models of care at the American College of Rheumatology’s (ACR)/Association of Rheumatology Health Professionals (ARHP) Annual Meeting. Koehn CL, Lendvoy K, Ma Y, Li L, Hoens A, Souveton M, Esdaile JM. 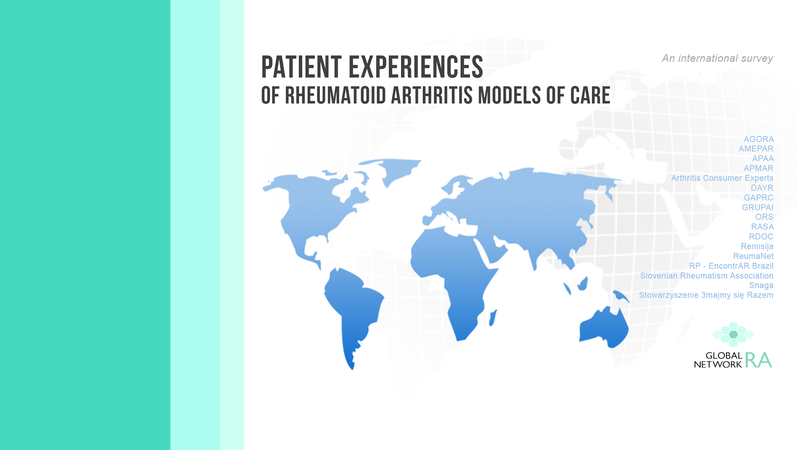 Patient Experiences of Rheumatoid Arthritis Models of Care: An International Survey [abstract]. Arthritis Rheumatol. 2017; 69 (suppl. 10). PAGs shared the link with their memberships through their websites and social media channels. Patients accessed and completed the survey on their computer, laptop, tablet or smartphone. Note: Kantar Health, a global market research company, hosted the survey. Funding support for the survey was provided by F. Hoffman-La Roche Ltd.